I am home for Christmas, way, way out in the country, where adventures are difficult to come by unless I was to borrow either the megatruck or the megatractor to go tens of miles into town – where there still would be little new to do. Dad offered to let me castrate a calf, but this vegetarian refused. I have pretty much done everything else possible on the farm/ranch over the years though, such as: built fence, clipped duck wings, wormed goats and trimmed their hooves, helped round up lost cows, harvested apples and pears, made preserves, and walked in the fields at midnight to admire the stars. But I had a memory from when I was a tween or so, of my dad making candles. He hasn’t done it since, so I suggested that we do that together. Dad had to mentally shift gears from being a rancher trying to get a barn rebuilt, to someone who could actually pause and catch his breath. But when we started digging out the old candle-making equipment, he started to get really excited, as did I. Mom also has made candles, which I didn’t know about, but she encouraged my father and I to do this just the two of us. (Of course, we asked her for advice on how to do this, which she gamely gave). So here is the action! The picture of the final candles will be added tomorrow, as they have to cool overnight. Dad and the candle-making works in the kitchen of our old cabin. Apparently something my mother had done – a pine cone dipped multiple times that we found in the cabinet. Dad, and a three-wick candle he had created umpteen years ago that he just found in the cabinet. Dad fixing up the wick for his candle and plugging the hole at the bottom with clay. Stringing the wick through my mold. Melting the wax in a hot pan of water. Started adding the dye. My first pour – to secure the base in the candle, and to ensure the mold isn’t leaking. My freshly poured candle, reflecting the cabinet above. Some of the scents my parents had. My various projects. 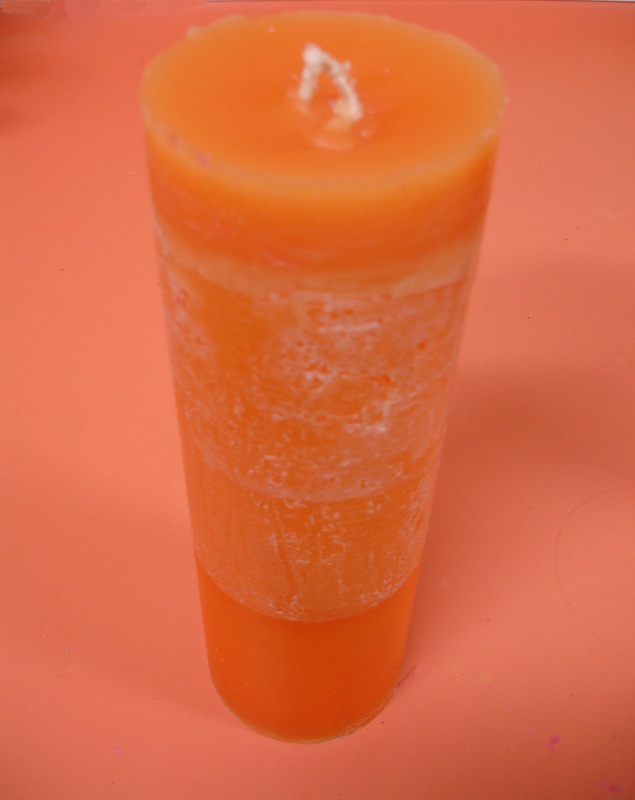 The square candle (a holiday red) is cooling, and I am about to pour a yellow/orange crystallized candle. Initial mix of my jasmine/cinnamon candle. Letting it cool a little, so that some crystals I added will remain suspended while pouring. (ha! easier said than done). Candle just starting to congeal. Dad’s candle looking all wonky as it dries and shrinks. They do that, and one has to poke a hole down the center, then pour in another round of wax to fill in any air pockets, and top it off to a smooth surface. The chickens waiting for us at the front door of the house when we returned. Boy, it looks country, doesn’t it? And here is the final candle, one of them anyway. This turned out nice, although the jasmine/cinnamon scent is a potent combination. You can see that the middle part of the candle has more of a crystallized effect, that’s where I added a more congealed wax, so that the crystals wouldn’t sink. Look at me sounding all professional. But one could really experiment here…. And I think this may be the last adventure for 2014. We’ll see if I can squeeze in another one, so stay tuned. P.S. I just came across this website of candle-making terms, which gives a hint for how complicated candle-making can get: http://www.candlecauldron.com/dictionary.html.